These lines are differentiated by the standard equipment that they include, while they share a lot of common options. 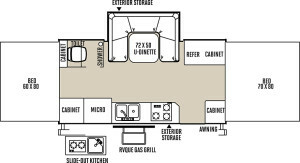 Forest River’s High Wall series of Flagstaff camping trailers has sidewalls that are a little taller than normal, which means that these units are taller than other Flagstaff camping trailers when they’re folded up. They also have more headroom when set up and some premium interior finishing touches that you may appreciate, like tile flooring, stainless steel, and cherry-colored cabinetry. Some High Wall models include slide outs, which provide more interior living space, and fully enclosed toilets for more privacy. Some of Flagstaff’s High Wall models include slide outs and enclosed toilets. Courtesy Forest River RV.